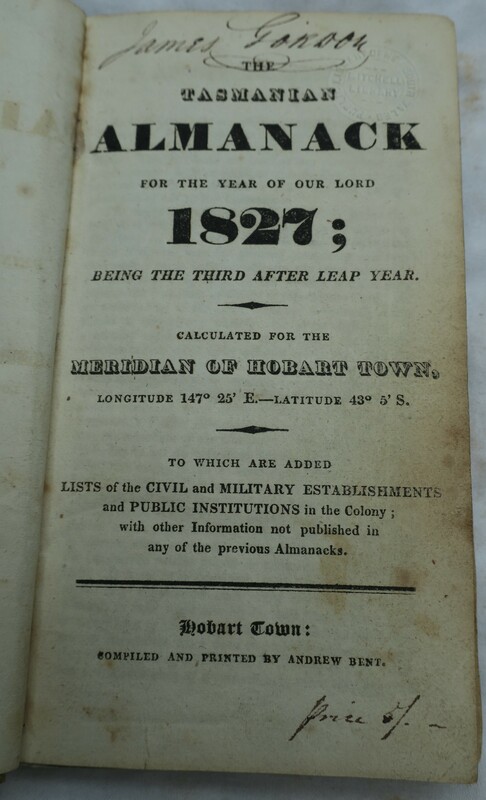 The Tasmanian Almanack for the Year of our Lord 1827; being the third after Leap Year. Calculated for the Meridian of Hobart Town, Longitude 147° 25′ E.—Latitude 43° 50’ S. To which are added Lists of the Civil and Military Establishments and Public Institutions in the Colony; with other Information not published in any of the previous Almanacks. Hobart Town: Compiled and printed by Andrew Bent. Ferguson 1146. Copies: Allport; ANL (FC); BL (cannot locate copy); Crowther (lacks t.p. ); DC; ML TSL; TU; VSL; Wilson collection. Advertisement in CT 1 Dec. 1826 notes the almanack was in the press. To be published about 27 Dec. Price 5 shillings on delivery. This copy in ML is a special binding with interleaved blank pages and belonged to James Gordon. He has made extensive ms. annotations and appears to have sent it (after receiving the next year’s edition) to a friend or relative in Britain. [Van Diemen’s Land. Acts. 1827, no. 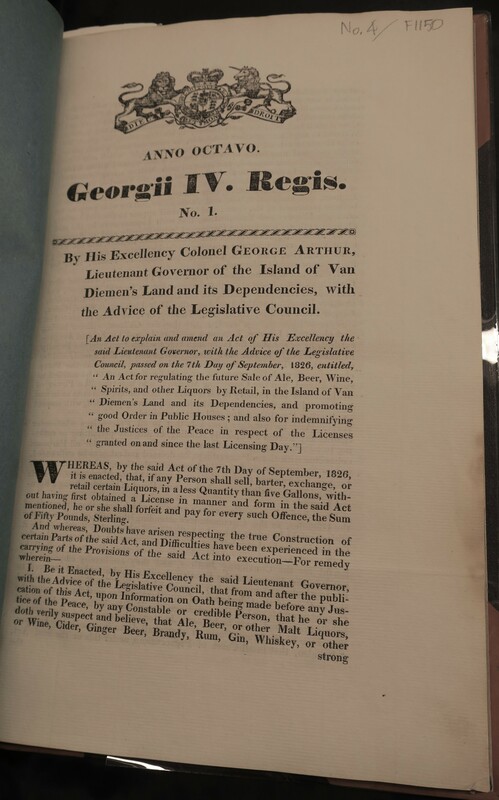 1] An Act to explain and amend an Act of His Excellency the said Lieutenant Governor, with the advice of the Legislative Council, passed on the 7th Day of September, 1826, entitled, “An Act for regulating the future Sale of Ale, Beer, Wine, Spirits …”. At head of title: Anno Octavo Georgii IV. Regis. No. 1. 4p. Colophon: Printed by A. Bent, Hobart Town, Van Diemen’s Land. Acts no. 2-5 of 1827 were numbered consecutively with no. 1, but printed by James Ross. A variant printing was issued as a supplement to the Hobart Town Gazette 22 Sep 1827 with colophon: Printed by A. Bent, at the Colonial Times Office, for J. Ross, Government Printer. 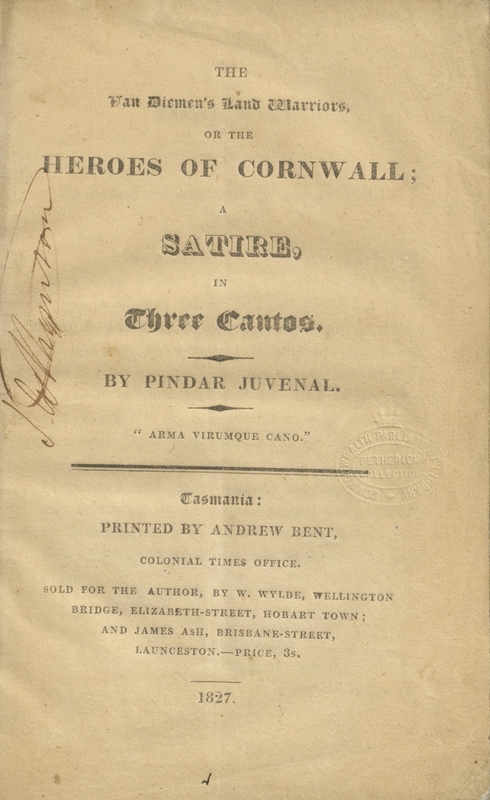 The Van Diemen’s Land Warriors, or, the Heroes of Cornwall: A Satire in three Cantos by Pindar Juvenal. “Arma virumque cano.” Tasmania: Printed by Andrew Bent, Colonial Times Office. Sold for the Author, by W. Wylde, Wellington Bridge, Elizabeth-street, Hobart Town; and James Ash, Brisbane-street, Launceston. Price 3s. 1827. 32p., 19.5 x 13 cm. Paper in ML copy has water mark of possibly two intertwined Ms and is counter marked 1823. Plain blue paper covers. The first book of verse printed in Tasmania, giving a satirical and somewhat ribald account of the (imaginary) attempts of a number of citizens to capture bush ranger Brady. Advertised as ‘in the press’ in CT 14 Sep. 1827, price 2s. 6d.Publication was imminent on 12 Oct. when the price had increased to 3s. IN THE PRESS, and will be Published (for the Author) in a few Days, “THE VAN DIEMEN’S LAND WARRIORS, OR THE HEROES OF CORNWALL; a Satire, in three Canto’s, by Pindar Juvenal.-Price, 3s., to be sold, by Mr. W. Wylde, Wellington Bridge, Hobart Town ; and Mr. James Ash, Launceston. 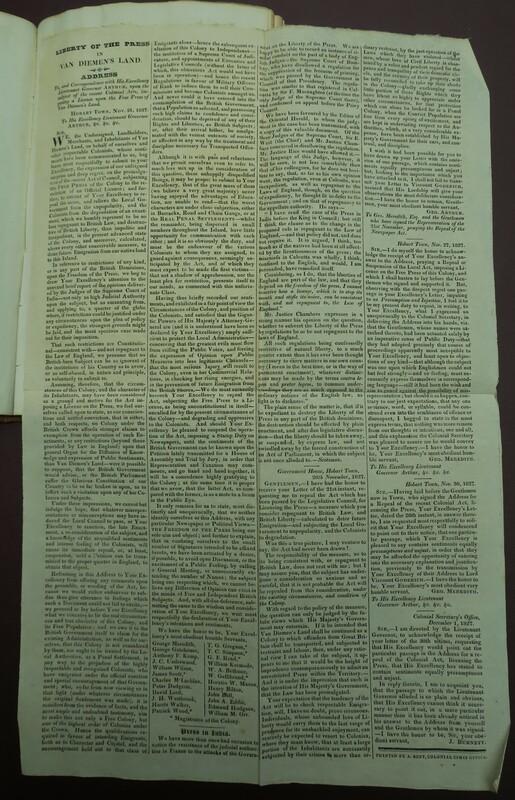 A few copies were still on sale at the Colonial Times on 2 Aug 1829 at the reduced price of 2s. The authorship has been attributed to Robert Wales although this is not certain. Others have been suggested including James Atkinson and Evan Henry Thomas. ANL copy is inscribed on t.p. : J.G. Thompson. Also has sections of text underlined throughout, and on p. 15 the note ‘My opinion of this work is that it should be suppressed and any existing copy burned. J.G.T.’ This would appear to be simply Thompson’s own opinion, and the work was never officially banned. 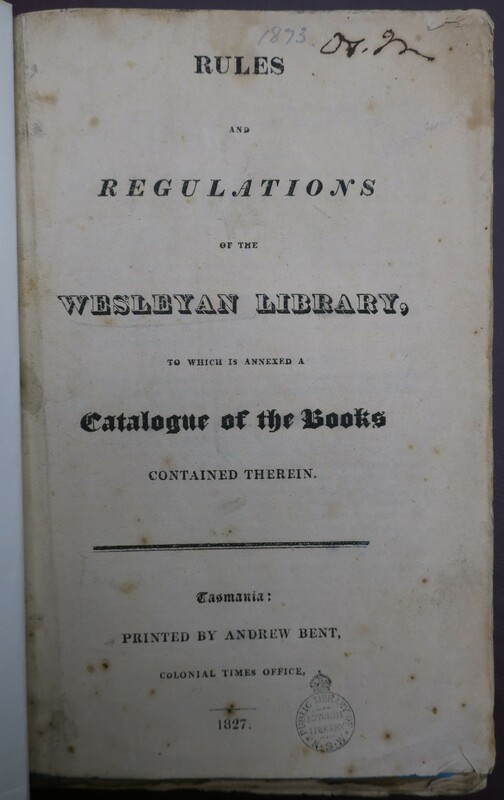 Rules and Regulations of the Wesleyan Library, to which is annexed a Catalogue of the Books contained therein. Tasmania: Printed by Andrew Bent, Colonial Times Office. 1827. 10p., 20 x 13 cm. Paper watermarked 1823 (possibly 1825?). Blue paper covers. The rules have been substantially revised from those printed in the Observations and the list of books has also been completely redone. Issued for the 2nd anniversary of the Wesleyan Library and probably printed early Sep. 1827- date on footnote on p. 10: August 27, 1827. Numerous books in the Crowther collection bear this book plate with Wesleyan Sunday School book plate pasted on top. The books are in similar old binding of blue paper covered boards some retaining light brown paper back strip with printed paper labels on the spine. Possibly bound by Bent’s workmen. 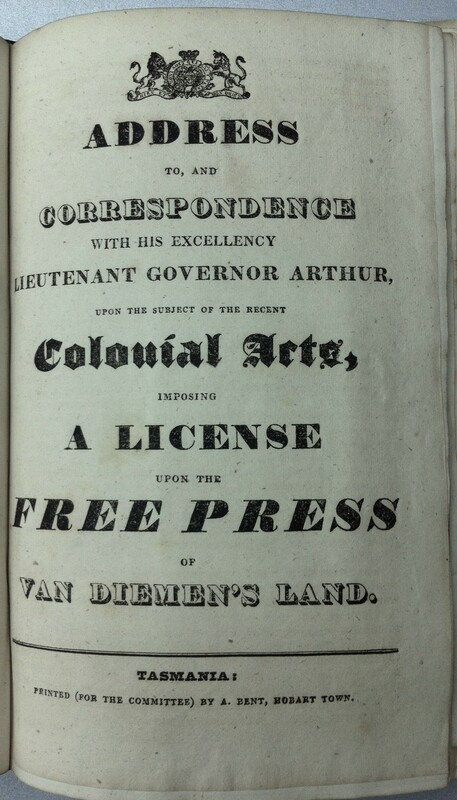 Address to, and Correspondence with His Excellency Lieutenant Governor Arthur upon the Subject of the recent Colonial Acts imposing a License upon the Free Press of Van Diemen’s Land. Tasmania: Printed (for the Committee) by A. Bent, Hobart Town. Also issued (possibly later) as a broadside headed: Liberty of the Press in Van Diemen’s Land. Address dated 21 Nov. 1827. Also published as a long advertisement in the HTC 8 Dec. 1827 and in CT 14, 21 and 28 Dec. Signed by 24 merchants and landholders, including 4 magistrates. 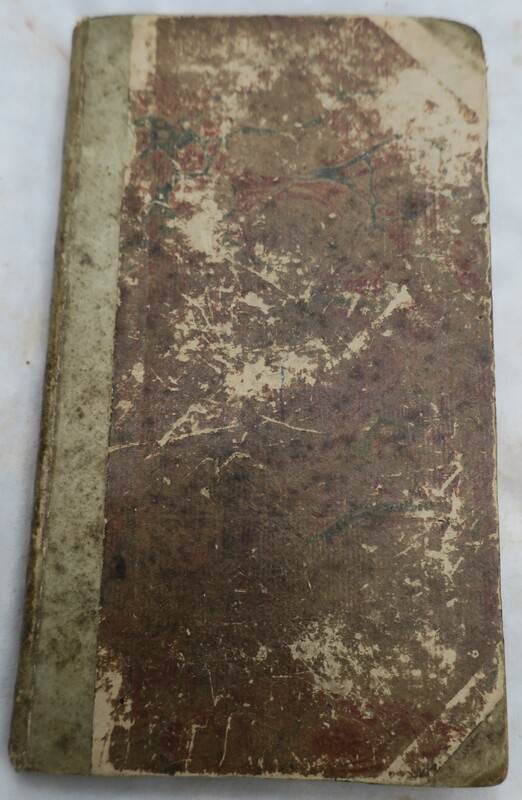 ML copy bound with: Correspondence between the local government of Van Diemen’s Land and the proprietors of the Colonial Times … [and other papers]; George Meredith was one of the prime movers and headed the list of signatories. A copy was sent to Secretary of State by T .G. Gregson (another signatory) in Jan. 1828 and is included, with other subsequent correspondence not in the printed address, in CO280/18 f. 331-344. Arthur took great umbrage at one paragraph, and was also furious that Colonial Surgeon James Scott, a magistrate, had signed. There was much subsequent correspondence to try to discover if Scott had been coerced, and whether he should be removed from the Commission of the Peace (in the end he was not). A variant printing of the previous item F1098c. A copy is tipped in to the Dixson Library copy of: Correspondence between the Local Government of Van Diemen’s Land and the Proprietors of the Colonial Times … (82/153) and another into the same title in KCL London (sent by Bent to James Stephen when he was Undersecretary of State for the Colonies). 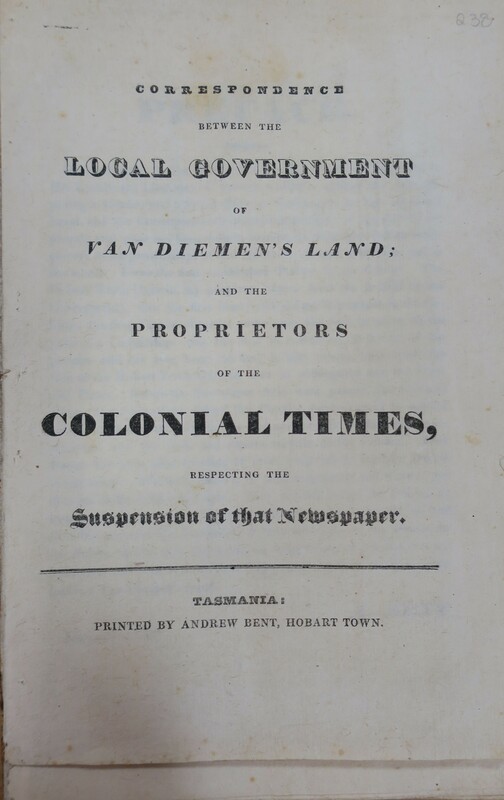 Correspondence between the Local Government of Van Diemen’s Land; and the Proprietors of the Colonial Times, respecting the Suspension of that Newspaper. Tasmania: Printed by Andrew Bent, Hobart Town. 25p. Preface dated Dec. 6, 1827. Text in 2 columns from p.4 to end. On 10 Dec. Bent sent an incomplete copy of this pamphlet (with correspondence up to 7 Dec. 1827) to Robert Howe, describing it as ‘what is concluded of a narrative.’ It was reprinted with supportive commentary in the Sydney Gazette on 24 Dec.
All surviving copies of the pamphlet include material up to 9 Jan. 1829 (over a year later) but it is not clear when they were printed. In 1836 Bent sent copies to England in association with his petition to the House of Commons. Recipients at that time included Joseph Hume and James Stephen. The copy in TAHO is filed with some issues of Bent’s News sent in to Sir John Franklin 17 Mar. 1837, although the sole letter on that file refers only to the newspapers. A copy was noted in the Royal Society of Tasmania’s report for 1850 and was listed in the library catalogue in 1856 but has since disappeared. The copies in DC, ML and KCL are all bound with interleaved blank pages, and include additional material associated with Bent’s case in 1836 bound or pasted in. The TAHO copy is unbound, as issued. The paper size of the pages in last section is slightly larger, suggesting they may have been printed later and ‘tacked on’ to an earlier incomplete pamphlet. The text of the correspondence up to 8 Jan. 1828 was published as an advertisement in CT on 11 Jan. 1828, but without most of the additional and sometimes amusing commentary which is in the pamphlet. Cornwall Collegiate Institution, for the Education of Youth, and the Advancement of Science, and Literature. Tasmania: Printed by A. Bent, Colonial Times Office, Hobart Town. 1827. 15p. (1 blank leaf precedes t.p., 3 blank leaves at end), 19 x 12.5 cm. Title also printed on blue paper cover (ML copy much faded) with decorative border. Probably the prospectus referred to by the Sydney Monitor 24 Feb 1827.